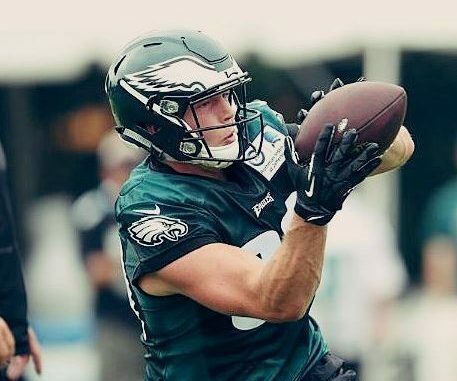 A hamstring injury stalled the North Vancouver’s tight end’s training camp, but now he has eyes on a practice squad spot. Adam Zaruba’s time with the Philadelphia Eagles is back on pause. The North Vancouver tight end suffered a hamstring injury last week, prompting the NFL squad to put him on waivers and offer him an injury settlement. That means Zaruba, who signed a futures contract earlier this year, is guaranteed to be paid through the end of training camp. Zaruba told The injury wasn’t serious, just bad timing. “They need healthy legs,” he said. After clearing waivers, Zaruba was placed on injured reserve. But the team offered him a payout and a release, which he accepted. He’s now free to sign with any NFL team — including the Eagles, once the season starts — or perhaps sign on with the Saskatchewan Roughriders, who hold his CFL rights. Zaruba said he was hopeful of landing a spot on an NFL practice squad after teams cut down to their regular season 53-man squads on Sept. 1. If still remains unsigned after that, expect Rugby Canada to make a big push for him to return to their fold. They showed interest in him last fall, after he was previously cut by the Eagles following his first NFL training camp. The big man declined, saying his focus remained on seeing how far he could in NFL football. Zaruba played football in high school at Carson Graham Secondary in North Vancouver and was on the practice squad at Simon Fraser University for a couple seasons, but never played collegiate football. He played sevens for Canada from 2014 to 2017, using his size and speed to devastating effect. The Eagles first signed Zaruba ahead of the 2017 training camp, drawn by his raw skill set. In a workout for the Eagles, Zaruba recorded a 4.49 in the 40-yard dash, a time that would have placed him second among tight ends at the 2017 NFL Draft Combined. What’s the Real Nature of Ahmed Naji’s Novel ‘The Use of Life’?